As with many other things in life, HP’s tx2000z tablet PC http://en.wikipedia.org/wiki/Tablet_PC isn’t perfect, but it isn’t bad, either. On the plus side, we really like its design and appreciate how well it has been engineered to work as a tablet PC. But its compact form and portability are offset by poor battery life that demands a bigger and heavier battery (if not multiples thereof or a big external battery pack). The touchscreen is convenient, but it also introduces some blur to the images that the tx2000z produces on its 12.1" WXGA+ glossy bright screen. 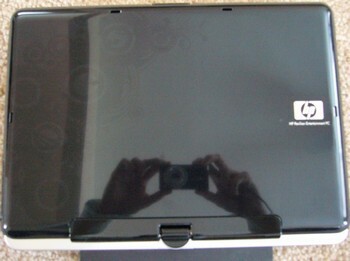 All in all, however, we think the HP tx2000z is a very usable tablet PC, and it makes a nice notebook as well. It is well-suited for a student or a traveling professional who doesn’t need a ton of processing power or graphics capability to handle everyday computing needs. HP has been bringing some thoughtful design to the laptop market for the past few years. 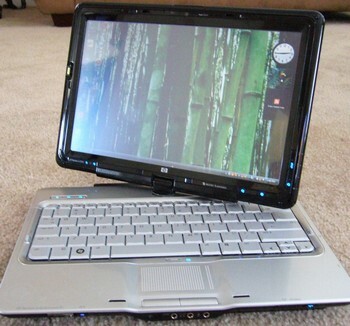 This laptop is especially unique -- it’s a convertible notebook with an entertainment focus. The tx2000 seems much faster than the benchmarks it posted, and we didn’t feel hampered by the AMD processor platform. Unfortunately image quality suffers on the touchscreen, lacking the clarity and vibrance of other displays. Also, we found the digitizer to be inaccurate when registering touches, although the inking was easy to use. Calibrating the pen and the screen helped, although the hand writing recognition software found it difficult to read my handwriting. To be fair, it’s not easy for me either. As a laptop, this device is easy to recommend. However, I wasn’t impressed with the accuracy of the active digitizer. 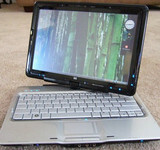 I’d like to see what HP brings to the tablet with their next refresh. With a more consistent method of transcribing penstrokes to electronic letters, HP will have a real hit on their hands. Until then, this laptop is only halfway there. If this 12-inch convertible tablet laptop looks familiar, that's because almost exactly one year ago, we saw HP's first so-called entertainment tablet, the Pavilion tx1000. That system impressed us with media control buttons, dual headphone jacks, and a finger-sensitive touch screen, making for one of the only tablets we've seen to aim beyond the usual corporate or industrial customer base. HP's Pavilion tx2000 combines a convertible tablet design with an entertainment-focused laptop to create an interesting hybrid, thanks to an improved tablet screen and mini remote control. The tx2000z is going to be a hit with all the mainstream users. HP gave this model just what it needed. 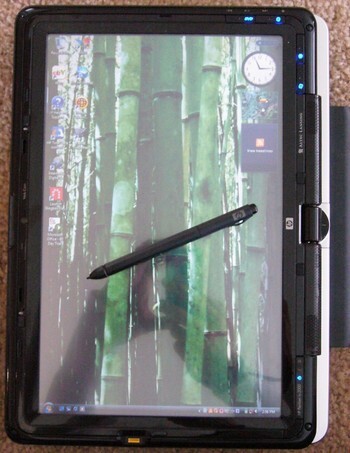 The active digitizer and touchscreen make this a true tablet PC now, but it still maintains the entertainment notebook status unlike any other model on the market at this time. The mini remote and multimedia buttons are very convenient when conducting a presentation or watching movies. If you want to do some work the pen is responsive for photo editing and taking notes is great. Not only does Vista help with handwriting recognition, but so does the active digitizer and fact you can calibrate the pen. The tx2000z has that personal feel that you don't find in many tablets especially with its sleek glossy appearance. The HP Pavilion tx2000z's Wacom capabilities make for a much-improved handwriting experience. For the time being, AMD processors are your only option, which is fine for running basic office applications and tablet software, but they tend to produce more heat than their low-voltage Intel competitors. 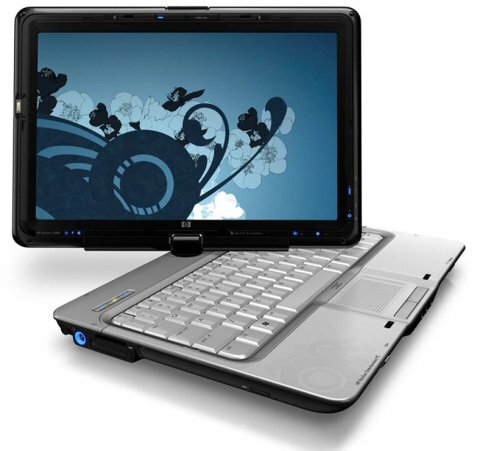 If an optical drive is not a must, the Fujitsu LifeBook T2010 and the Lenovo ThinkPad 61 Tablet are better choices. The HP Pavilion tx2000z is a good second attempt, adding Wacom technology for a better writing experience, but the 2.4-GHz AMD processor can get hot at times. In 65nm produced dual-core processor based on the K8 core. Compareable performance to a slower clocked Core Duo CPU with 1MB Level 2 Cache (Celeron Dual Core e.g. ).